Stop taking your games so seriously. As much as you may love your “Halo” or “World of WarCraft,” it turns out that the so-called “casual gamers” outnumber you 20 to 1. What started with “Solitaire” and “Mine Sweeper” has grown into a global phenomenon, with players of all ages logging on to the Web and downloading easy-to-learn games by the millions. And as the market grows, so does the quality of the games. Visit http://www.switchball.com, for example. 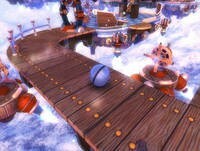 Download a trial version of “Switchball,” a kinetic puzzle game, and for your trouble you can play several levels that challenge you to roll a ball through a series of mazes and obstacle courses. It’s as easy to understand as it is to play. And for $20 you can unlock the remaining levels and fritter away the time between meetings on your laptop. The Casual Games Association estimates that 150 million people worldwide play these engaging trifles. That interest adds up to an anticipated $1.5 billion in revenue by next year, or about 10 percent of the total dollars earned by the entire game industry. Even though big-budget, high-concept games dominate the game press and the fans’ attention, not everyone has the time or interest to figure out how to provide covering and target Locust troopers’ fire in “Gears of War.” Playing a hand of bridge or even enjoying a few games of “SpongeBob SquarePants B.C. Bowling” falls within the average computer user’s learning curve. With an estimated 43 percent of casual games offered in a try-before-you-buy mode, and another 40 percent letting you pay for them by looking at ads, casual gamers don’t have to make an investment to see if a title will scratch their entertainment itch. As the market grows, so does the variety of games. Titles such as PlayFirst’s “Diner Dash” have become mainstays of casual play, sending the player running back and forth to keep greasy-spoon customers happy. “Chocolatier” combines a business simulation with a matching game that races players across the globe in an effort to build a sweets-making empire. The problem with casual games has nothing to do with quality or variety, but with their almost endless availability. Finding the right game takes a lot of effort, a lucky recommendation or, more often than not, a visit to one of the big sites such as shockwave.com, EA’s pogo.com or Microsoft’s Game Zone on msn.com. Taking it easy has turned into the next big thing in gaming. Who's It For: Long relegated to grandma and little-kid markets, the casual game has grown into a powerhouse of electronic entertainment. With something for everyone, it's not a matter of whether you're a casual gamer, but what kind of casual game you'd like best. If You Like This, Try That: Portal sites such as pogo.com and shockwave.com provide a gateway to new content. Or just search Google. A new casual game is never more than a few clicks away. Best Part: In almost all cases, you can try before you buy. This means no more buyer's remorse with $50 games that don't live up to the cool graphics on the box.